Alfonso Cuarón’s Y Tu Mamá También is the kind of great movie that could easily have the wrong influence on young filmmakers, inspiring unnecessarily stylized camera moves and digressions in simple stories of everyday life. 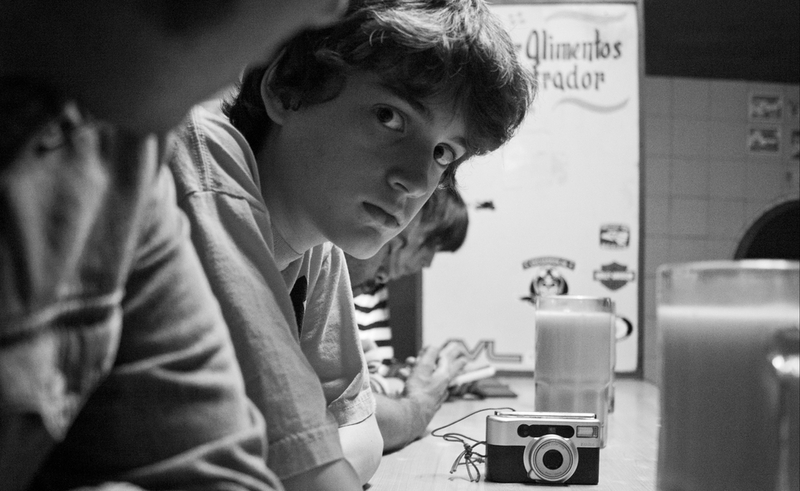 But the opening scene of Alonso Ruizpalacios’ debut feature Güeros apes Y Tu Mamá También in the right way. For the first few minutes, Ruizpalacios focuses on a harried mother as she tries to quiet her screaming baby and get dressed for work, all while the phone rings incessantly and she nurses a black eye. Güeros isn’t about the mother, who’s never seen in the film again. It’s about a teenage boy, Tomás (played by Sebastián Aguirre) who hits her with a water balloon as soon as she steps out of her apartment. Like Cuarón’s film, Güeros understands how young people can get so caught up in their own little adventures and dramas that they become grossly inconsiderate. Ruizpalacios has described Güeros as a road movie that never leaves town. Set in 1999—during a lengthy student strike provoked by the state raising tuition at the National University from a token two cents to an actual fee that some can’t afford—the film follows Tomás as, post-water-balloon, he’s sent to live with his older brother Sombra (Tenoch Huerta) and Sombra’s college roommate Santos (Leonardo Ortizgris). The boys are holed up in a flat so sparse and squalid, they have to borrow electricity from a downstairs neighbor. With classes suspended, they spend a lot of time sitting around complaining about the University’s plan to cut back on its free breakfast options. Then Tomás forces Sombra and Santos out of their torpor when he hears his favorite musician, aging folkie Epigmenio Cruz, is in a hospital somewhere in Mexico City. As the trio goes looking for Epigmenio—eventually joined by Sombra’s girlfriend Ana (Ilse Salas), one of the leaders of the student movement—they roll through areas of town they’d usually avoid. Güeros’ premise gives the film a loose structure, reinforced by the way Ruizpalacios varies his style in the story’s different chapters. The image is mostly static when the characters are stuck at home, but Ruizpalacios brings more energy and movement once they head out on their mission to find and thank their musical hero. Ruizpalacios and his co-writer, Gibrán Portela, don’t give these kids much dimension or personality. Instead, they use them as filters to view Mexico City’s various subcultures, from street gangs to privileged patrons of the arts. But Güeros’ running joke—and it’s a good one—is that wherever Tomás and his companions go, they’re dismissed as weak and inauthentic. Everyone they meet seems more concerned with rejecting people who don’t “belong” than in coming up with compromises that allow them to coexist. Stylistic play is no substitute for a clean, compelling narrative, and even with all the visual variety, Güeros does start to repeat itself after a while. But every five minutes or so, Ruizpalacios comes up with something strikingly expressionistic. He cuts all the sound whenever anyone listens to Tomás’ Epigmenio cassette, and occasionally cranks up a dissonant tone on the soundtrack until it tweaks viewers’ sense of balance. He zooms in close on Santos scratching his flaky feet, and keeps a young tough blurry as he menaces the heroes. In one of Güeros’ most impressive sequences, Ruizpalacios balletically weaves the camera down a dorm-room hallway while Ana explains the university’s cliques. If nothing else, Ruizpalacios demonstrates that he has ideas, and technique. But the best parts of Güeros aren’t the flashiest. The movie’s wit is just as evident when it has groups of opinionated young intellectuals debating whether Mexican cinema is too focused on poverty, or when an open forum for striking students turns into a finger-pointing shouting match, with the different sides accusing each other of being covert government saboteurs. At one point, the boys lean up against a sign that reads, “To Be Young And Not A Revolutionary Is A Contradiction,” not long after an exasperated Sombra asks one of his classmates, “Don’t people have a right to be in the middle?” Güeros is a vivid illustration of factionalism’s brute outcome, which has people choosing up sides and tossing bombs at people, while dismissing their victims’ complicated lives and problems.